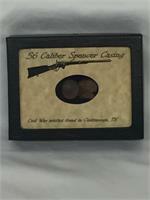 Own a piece of Civil War history. Each framed display contains actual artifacts from the Civil War. BATTLE OF CHICKAMAUGA ARTIFACT CASE-INCLUDES EIGHT ARTIFACTS FROM THE CIVIL WAR. 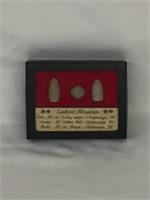 CIVIL WAR BATTLE OF CHICKAMAUGA, GA BULLET CASE - INCLUDES THREE AUTHENTIC BULLETS. CIVIL WAR BATTLE OF LOOKOUT MOUNTAIN ARTIFACT CASE- INCLUDES 3 ARTIFACTS. 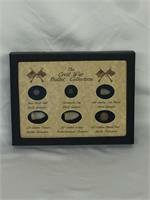 CIVIL WAR BULLET COLLECTION CASE. INCLUDES 6 BULLETS FROM THE CIVIL WAR. CIVIL WAR CONFEDERATE ARMY FLAG CASE. INCLUDES 2 BULLETS FROM THE CIVIL WAR. CIVIL WAR GETTYSBURG BULLET CASE. INCLUDES 2 BULLETS FROM THE CIVIL WAR. CIVIL WAR IN NORTH GA ARTIFACT CASE- INCLUDES SEVEN ARTIFACTS. CIVIL WAR IN NORTH GEORGIA ARTIFACT CASE- INCLUDES FOUR ARTIFACTS. 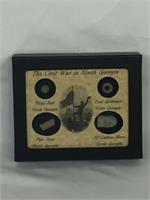 CIVIL WAR CASE- INCLUDES ONE CASING FROM THE CIVIL WAR. CIVIL WAR U.S. 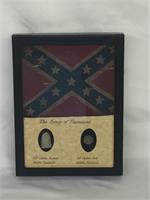 FLAG ARTIFACT CASE- INCLUDES FIVE AUTHENTIC ARTIFACTS OF THE CIVIL WAR. 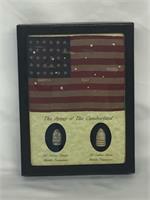 CIVIL WAR US FLAG BULLET CASE- INCLUDES 2 BULLET ARTIFACTS.